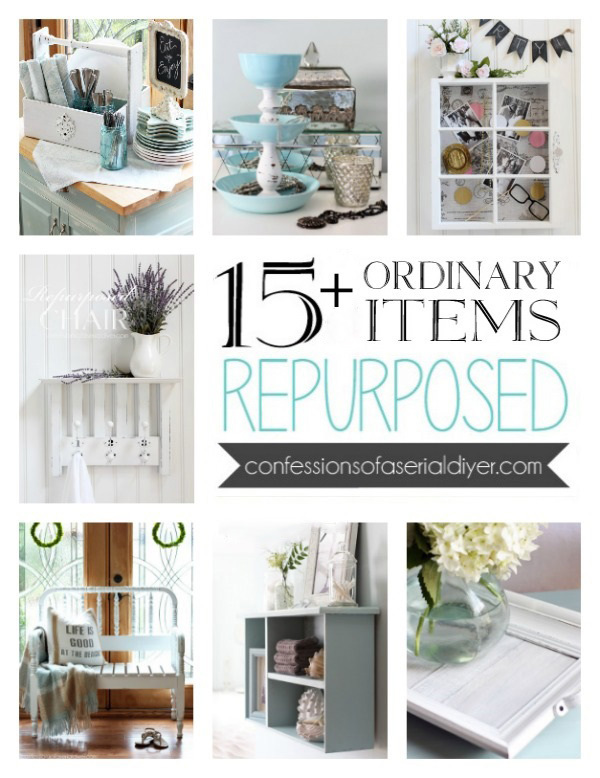 Can I tell y’all how excited I am that it’s Trash-to-Treasure Tuesday?? Amazing Friends, today I have actual trash to share which is even better! So y’all know how I moved into a new neighborhood, right? These nice people don’t really know how I like to pick through their trash that they leave on the curb, in search of potential treasures…except now they probably do. I saw that a POD was being delivered to the vacant house next door, and I was excited that we would soon have new neighbors. The next day I saw a huge pile of stuff on the curb and thought it was weird that someone would wait to move to purge all that junk. I mean why would they pack stuff they didn’t want? It turns out that the lady I met was the homeowner and she had been renting the house out. She had been using the fifth bedroom to store her own things and had decided that most of it just needed to go…like three perfectly good sets of skis! I introduced myself and asked if she minded if I took the skis for a holiday project and she was more than happy to let me have whatever I wanted. I did restrain myself though and just took the skis. 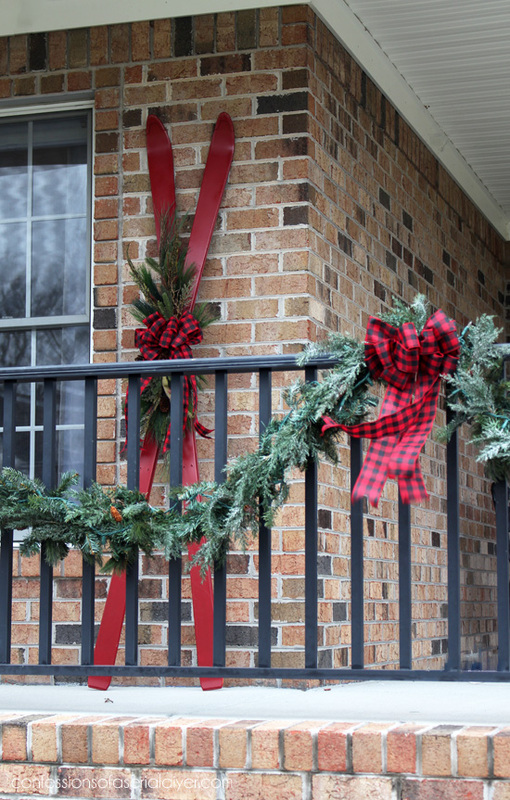 So of course my neighbors saw me walking back with them…”They’re going to be fabulous Holiday décor!”, I tell them. It’s amazing what spray paint, some pretty greenery (Hobby Lobby), and a big fat buffalo checked bow (also Hobby Lobby) can do! They have the most realistic greenery. I bought several of these when they were marked down quite a bit last year, and used them throughout our home to decorate. 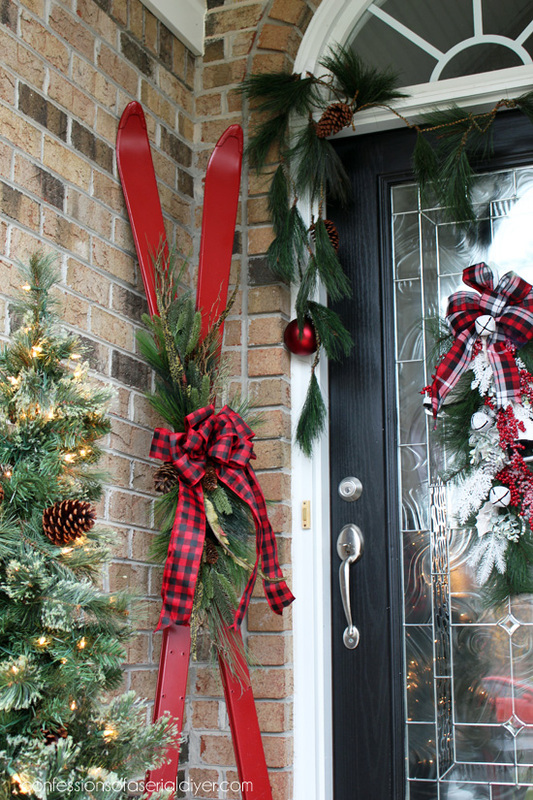 I’ll be sharing more Christmas décor soon! This project really could not have been any easier. After painting them (one coat on the backs, and two coats on the fronts), I drilled a small hole through the centers using a regular old drill bit. 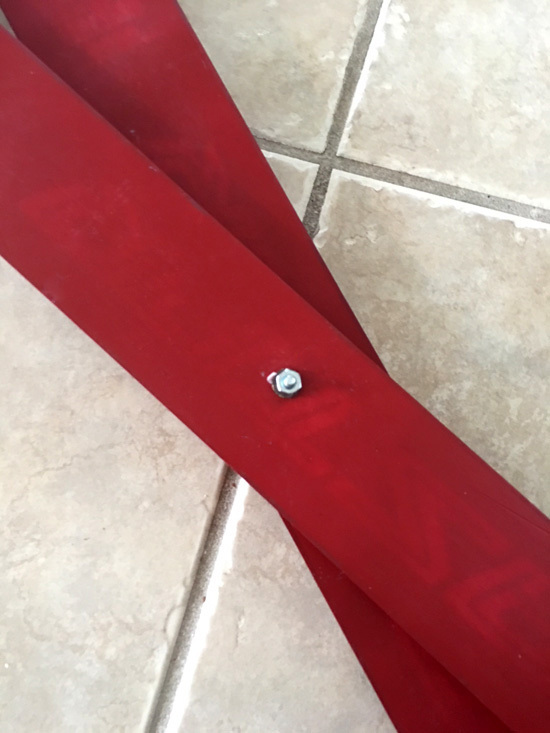 I criss-crossed them just how I wanted and then drilled right through both skis. I added a little more wire to each stem where you can’t see as well to hold them securely in place. Then I added another ready-made bow from Hobby Lobby to finish it off! 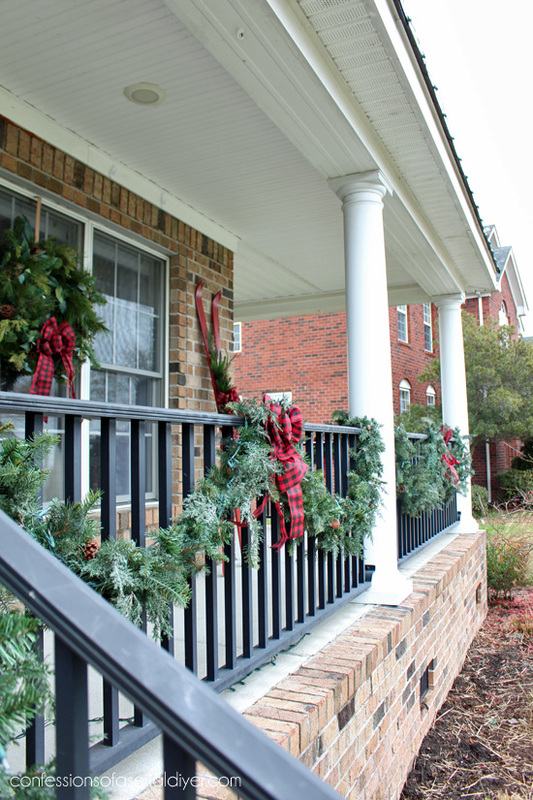 Such a pretty addition to our holiday porch! 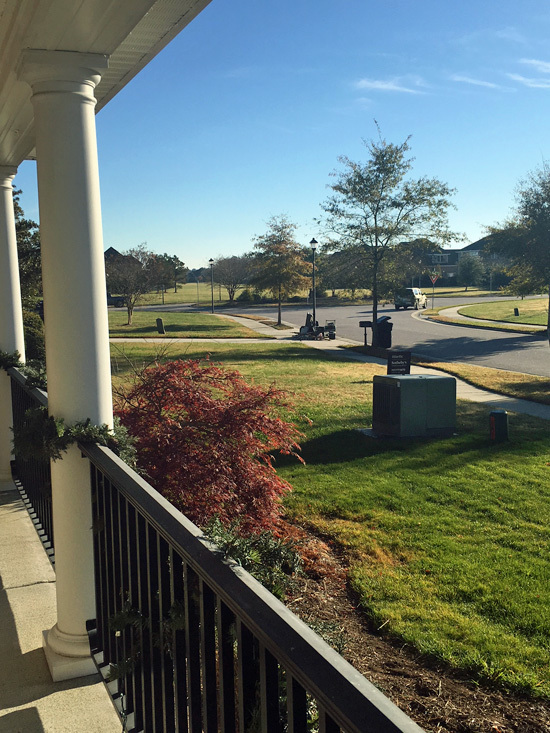 I just love this big porch! I found that sign and that more sparkly greenery at Michaels. I loved the height of these. 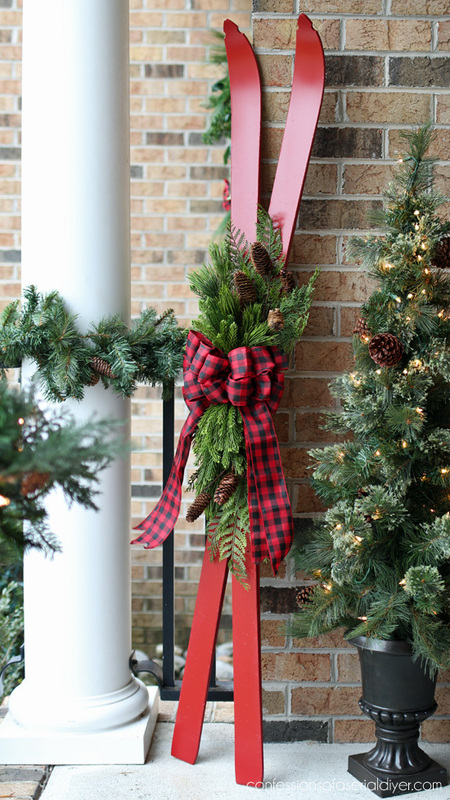 You could add these to just about any corner of your home for a festive touch. Adding a little set of battery-operated lights would make them even prettier! 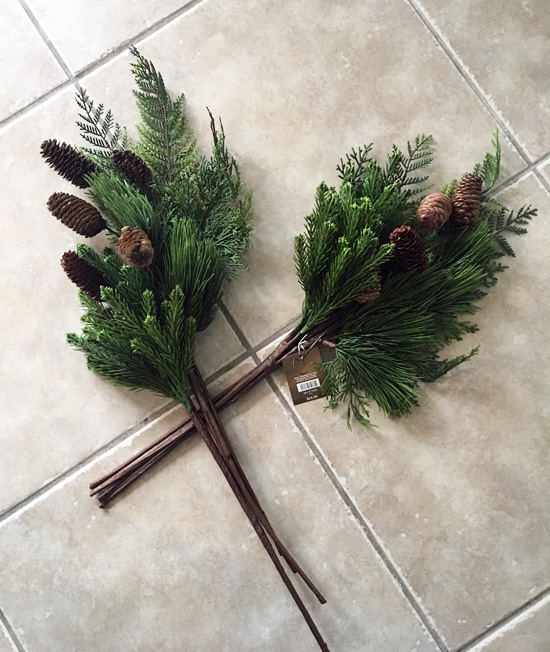 Of course I loved these as well…just something about that natural looking greenery! Don’t go anywhere just yet! 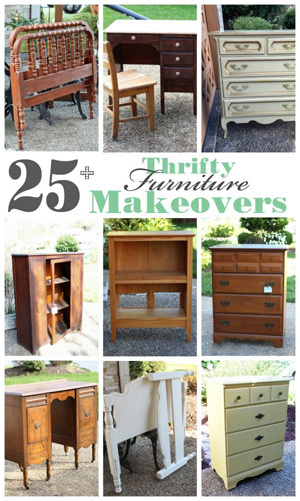 My Trash-to Treasure girls are sharing makeovers today too! I’ll be back on Thursday sharing my finished dining room decked out for Christmas! I was able to get the rest of the chairs to my dining set painted, so I can finally check that project off the list woohoo! 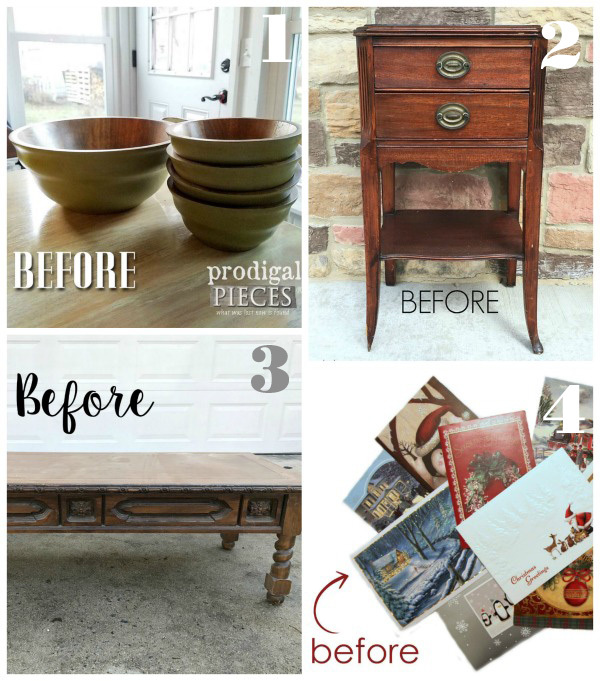 UPDATE: See how my dining set turned out plus see my dining room all ready for Christmas HERE now! Oh my I need to find some old skis but when in GA…that maybe hard!!! Christy for the SCORE! Now your neighbor can bring you all the good junk. Haha. 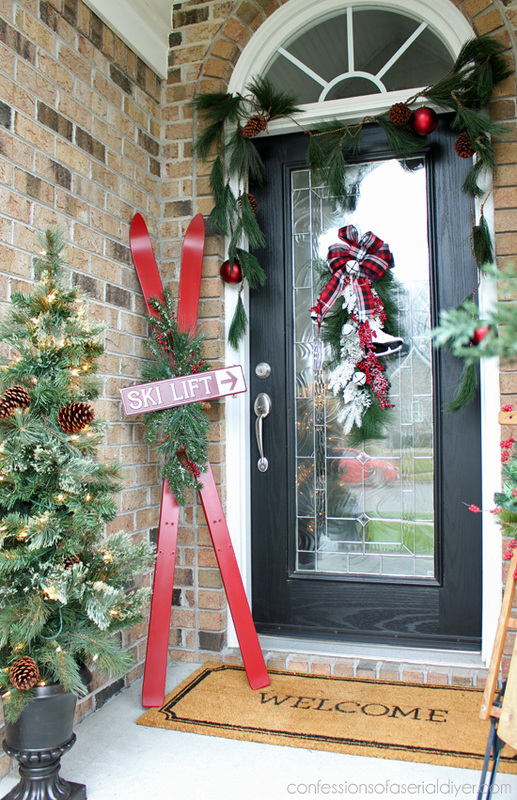 Love the skis and your beautiful holiday decor. Dang, you’re creative!! <3 Would never even have thought of that! I bet your neighbor wished she had kept these skis after seeing what you done with them. They are beautiful. 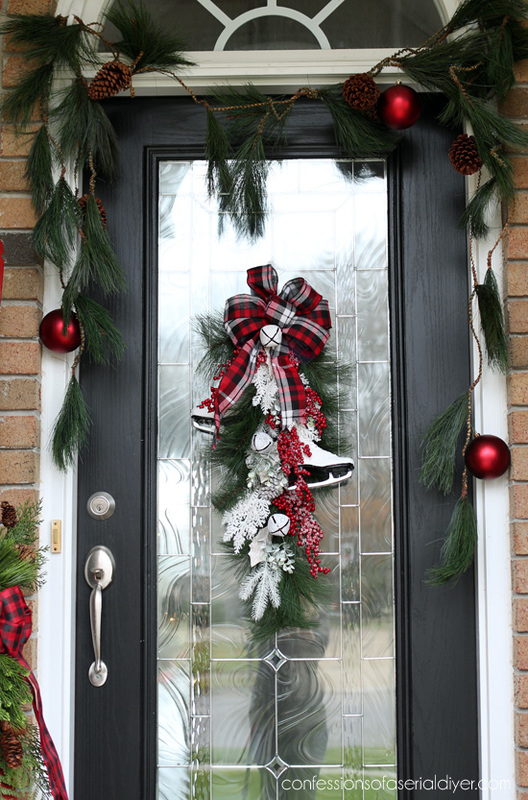 Also love the decoration on your door because have always loved anything with skates. You are amazing. What a lovely decoration this makes. The red skis with the greenery really make a statement. Now I will have to look for skis. And I may find some, you never know. 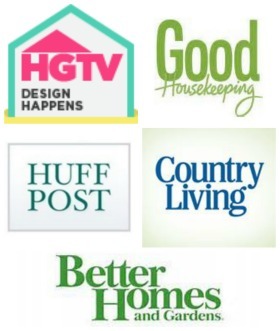 Christy, I never comment but you about the only blogger I follow – you do great work and are so creative! I LOVE the skis – I imagine the two were snatched out of your booth in a nano-second! And the wall in your office is so great – love the dimension it adds! Merry Christmas! No chance of finding old skis here in Florida…unless they’re water skis! Love how these turned out! Those are perfect! Makes me want to go find a pair of old skis myself. They look great! Beautiful! 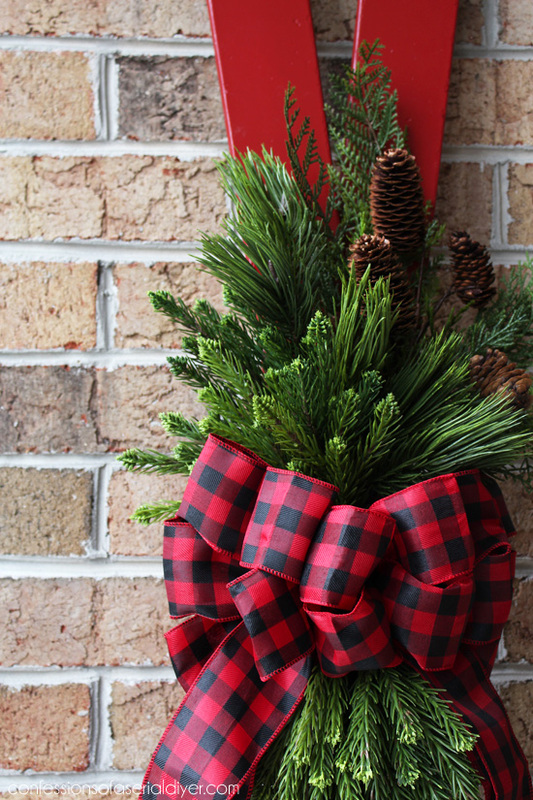 Looks great with your porch decor. Oh my goodness did those skis turn out gorgeous! 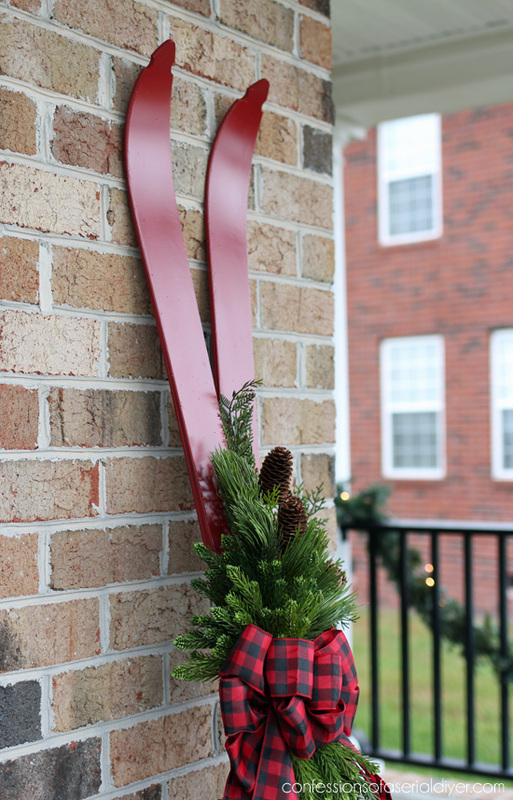 I love all the greenery and colonial red and the bow❤️❤️Did you make the bow? 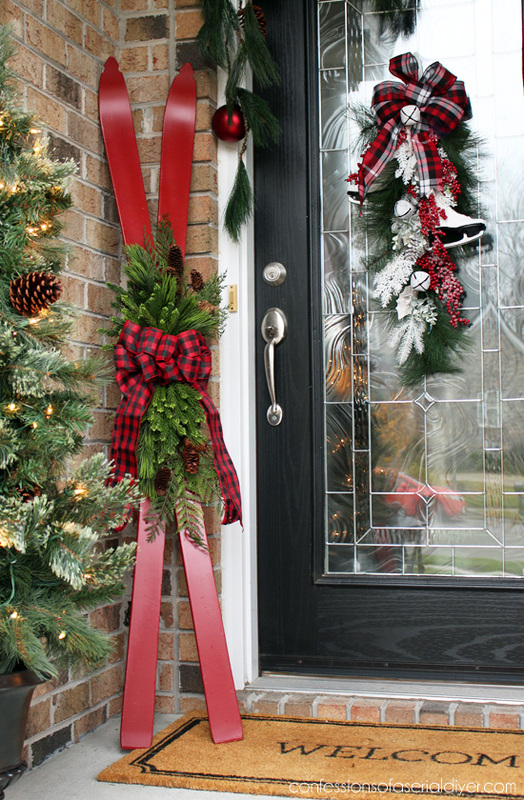 All your porch/front door decor is just stunning! What a great idea! 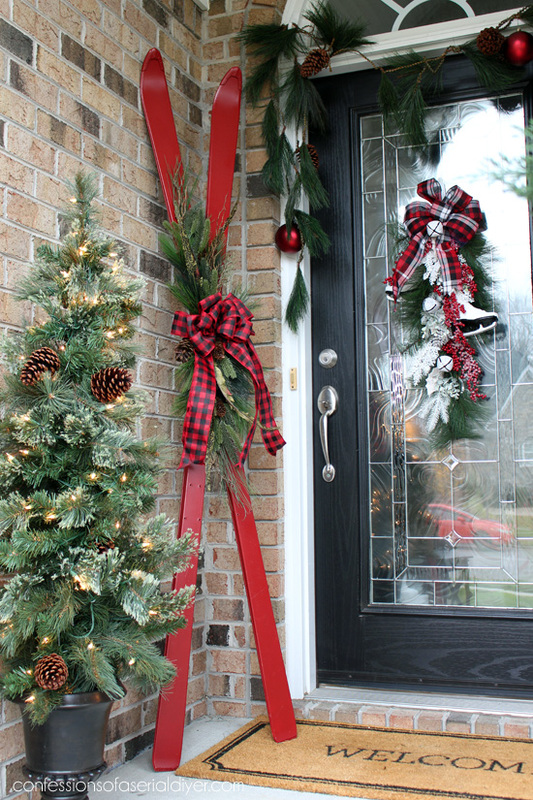 They look amazing on the front porch. 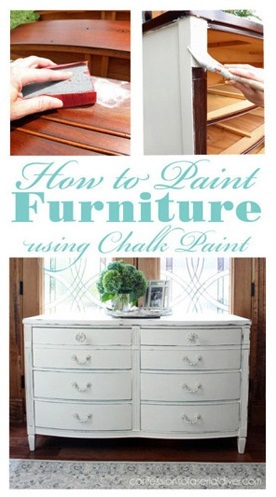 Paint and pre-made greenery—I think I can do that! And I just happen to have two sets of skis in the closet. Those turned out beautiful! And they could be left out for January as well. Great job!! So pretty! Haha, Guess what I have at my new front doors (we did a huge garage-to-entry remodel this summer… ALL summer)? A set of skis one of my boys snagged from the neighbor’s “dump” pile!!! I’ve been stowing them for about 3 years now waiting for the right place to use them. The old entry had only a narrow ledge beside the door, the new has the perfect space, happy me! : ) Enjoy your skis! Your imagination amazes me. Very cute. You did it again! 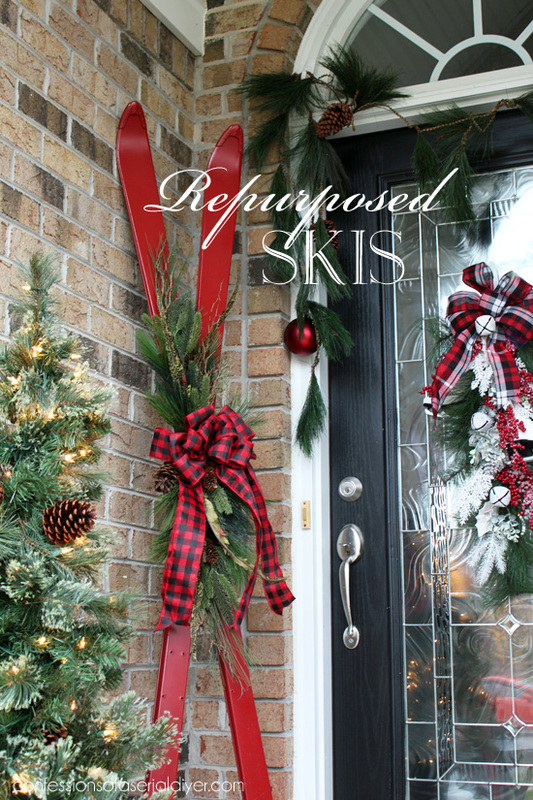 The repurposed skis are absolutely lovely! Wish I lived near the store where you have your booth! Keep up the great work! I love your posts! I love it. Your new neighbors will soon find out that you love trash 😉 and how gifted you are with it. Btw your office wall is so gorgeous. Your porch is so beautifully decorated and unique- Great Job. I enjoy your posts SO much! What a clever idea. I have an antique mall, and I would die to have a dealer like you! I am so glad to see you left the brick on your home as is. Although I love her to pieces, I cringe every time Joanna Gaines paints brick. 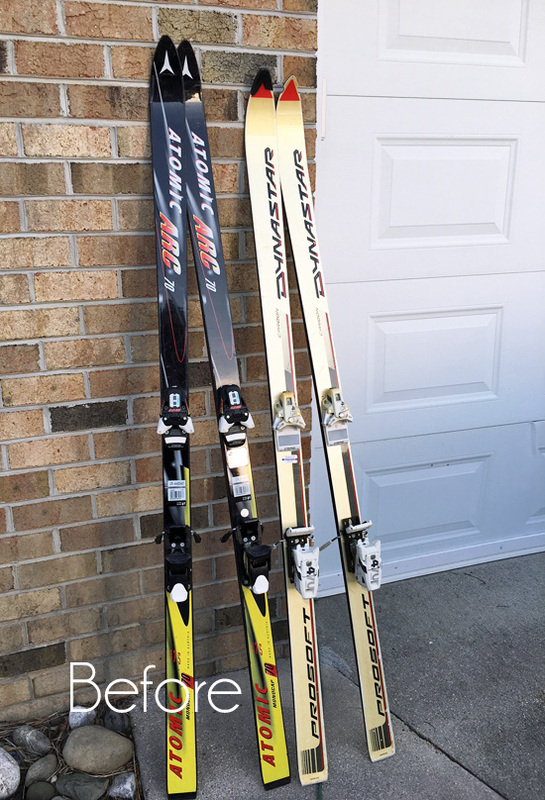 Ok, Why would a person put perfectly good skis out for the trash instead of trying to sell them and make a little Christmas money? BUT, yay for you that she did and you made GORGEOUS decor! Does it hurt at all to take them apart when there is nothing wrong with them? I just need to get over that part, right? The skis are beyond beautiful. What a brain you have that you can spot skis and see immediately how they can be turned into something so lovely. 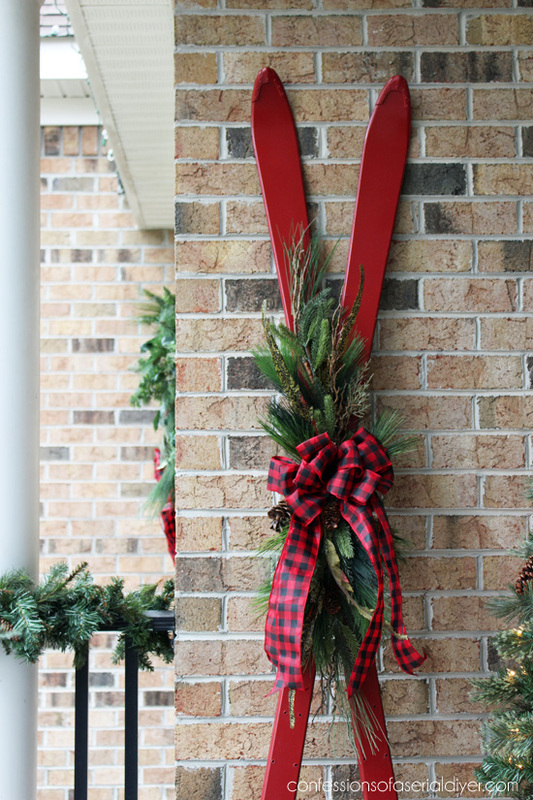 They add so much to the decor of your front porch. Wonderful transformation and so simple. Thank you for sharing this. Oh, nice find and so conveniently located! lol Very pretty, this goes so well with your home. I like the skater decoration on the door too, that’s really cute! I have old skis but they’re water skis. Everything looks so good! Great… now I’m on the look-out for a small set of skis! 😉 SO, SO pretty, cute, and adorable. They would work great on My Wee Abode’s outside landing! I bet they sell fast! Christy, you crack me up, a woman after my own heart! I am constantly scowering my neighborhood for said “Goodies”! I just love these, they look amazing! I’ve always wanted to try this project and even had my cousin who works on a maintenance crew at Wintergreen snag a set of old skis for me. Don’t be surprised if you see something similar on my porch next Christmas. 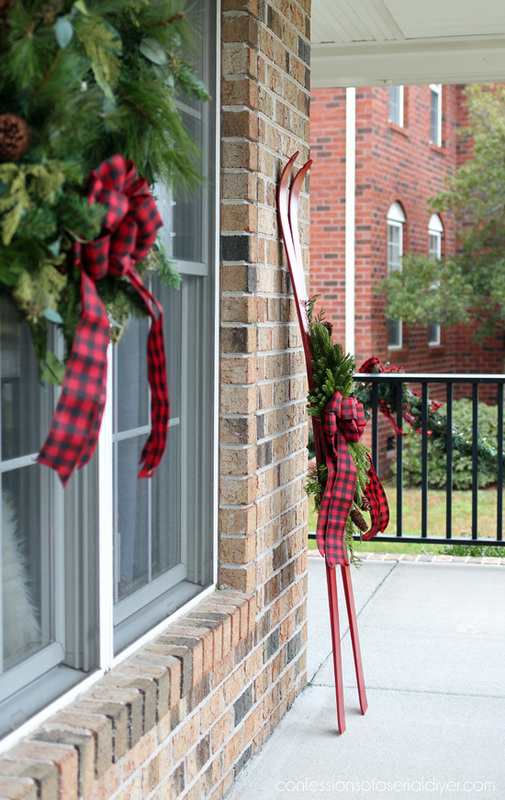 Your set looks perfect on your porch and I’ll bet that when guests arrive, they make a comment about this cute idea. So clever!! What a great find!! You are breaking in that neighborhood (or neighbors) well!! 😉 xoxo See ya soon! Hey Christy!! I ran right out to a sports store and begged for some trashed skis and they kindly obliged. 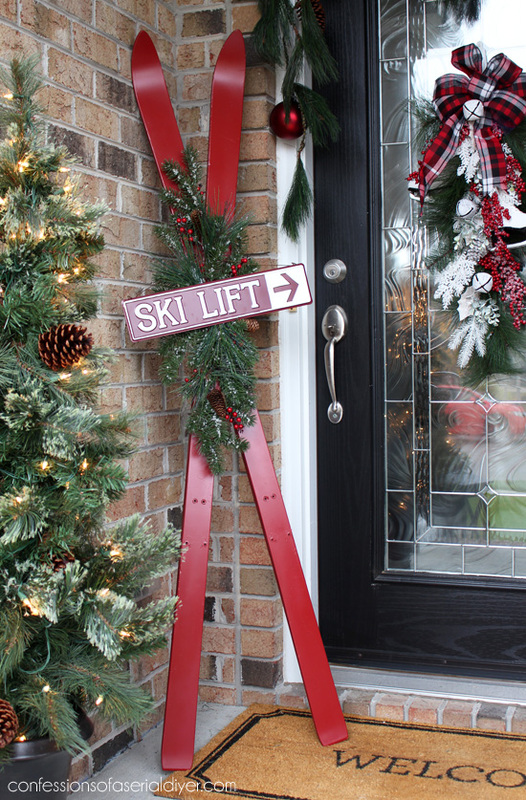 I made a repurposed ski holiday decor yesterday!! I tagged you on my instagram @sewswedish68. Hope you saw them. You truly are such an inspiration to me. Thank you for all of your awesomeness!!!!! Happy Holidays to you and your family. Oh Wow! Oh Wow! That is a Fabulous idea! Sooo pretty! 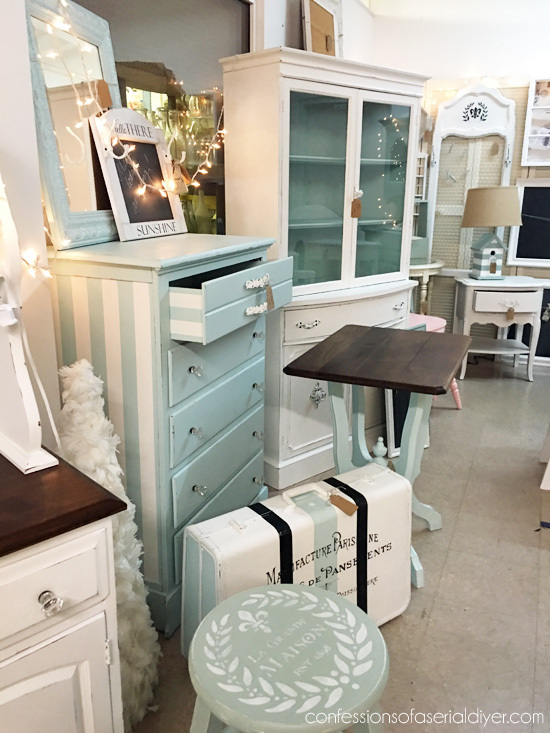 Love Love it all! Love me some buffalo Check! Thank you for this cute idea!!! I happened to have a pair of old skis in the garage! Hardest part was getting one of the bindings off. 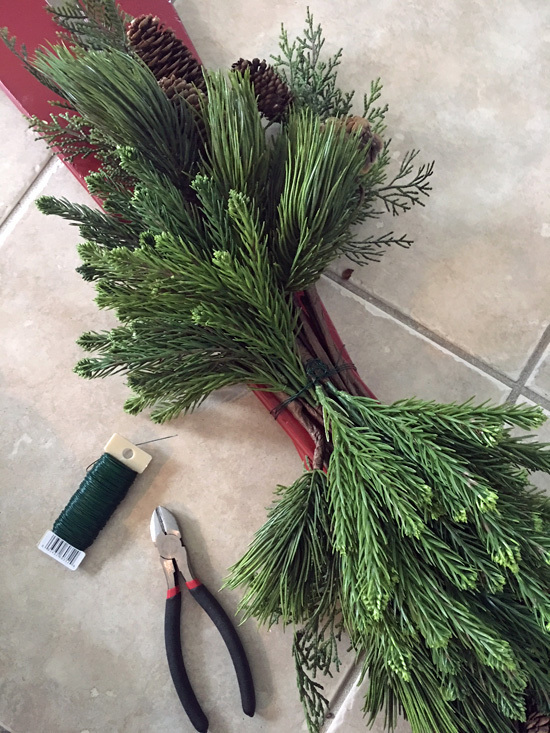 A trip to Home Depot (for paint) and Hobby Lobby for some greenery and 3 days after your post, I have my red skis!!! They are fabulous!!! Much gratitude for sharing your projects! When I first saw your ski’s, I grabbed my purse and ran to our Goodwill. I was so deflated when I saw the price tag of $24.99 EACH. I did end up finding affordable ones, and are they beautiful. My favorite project that I’ve done. Thank you so much. One question, were you able to get the words on the boards covered up? Oh awesome!!! I love this project too! I didn’t worry too much about the words on the bottoms of the skis showing through, but I gave the tops two pretty generous coats to cover up what was on them. 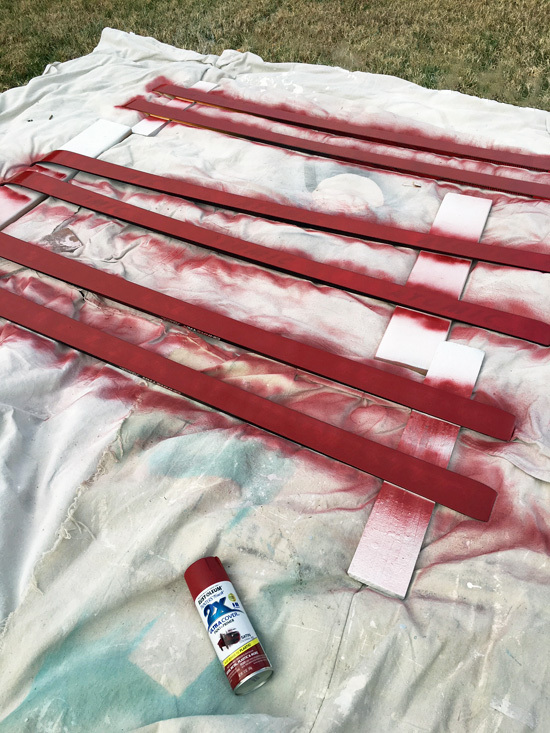 I never thought to spray paint skis! You’re brilliant! You can do so much with skis, especially if they’re painted. I even have sign from Michael’s! Thanks for sharing! I made the ski project and added lights looked so good we kept it inside would love to share the photos but I can’t see to add them I tried e-mailing you from one of your last replies but it came back. Let me know if you would like to see them. I LOVE this project soooooo much!!! Your creativity is amazing and you inspire me with every post! Thank you for sharing your creative genius with us! Happy New Year! I’ve followed your blog for some time. 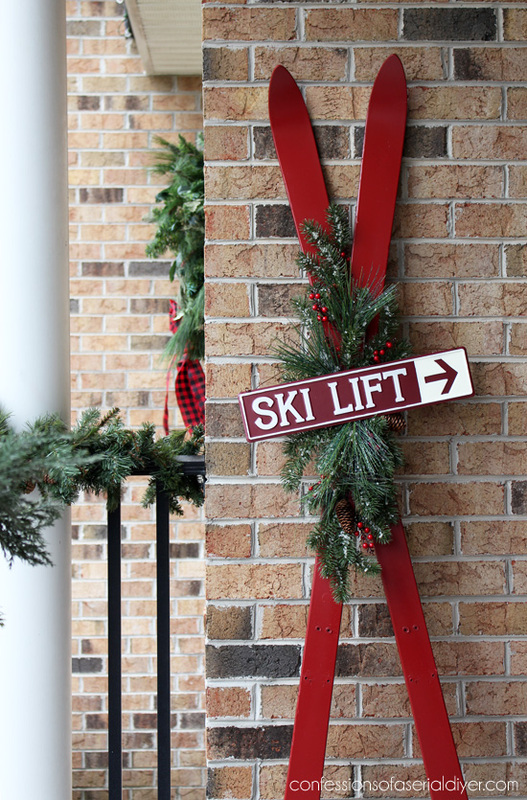 Your ski decorations were killer, loved them!